Use with any magnet-tipped tape measure. Strap holds tape measure securely in holder. 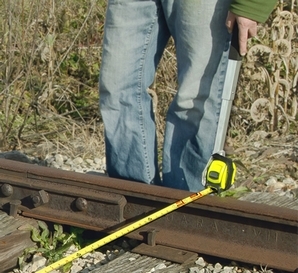 For railroad track inspections, worker can walk down the track and check to see if rails are within gauge tolerance without needing to bend down or stoop. • Handles collapses so holder stows neatly in tool trays. • Tape Measure not included.